As we left behind the vivacious bustles of the city and headed forward from Yelahanka, we could instantly sense a change in the landscape. We stared outside at the vast fields, the little tin shanties, the lush spread of green foliage dotting both sides of the way and could hear the merry chirps of the birds. By deviating left from the road leading further north towards Dodballapura, we encountered more greenery, amidst blue barricades fortifying spaces that are yet to rise into Bengaluru’s urban jungle. In next few minutes, we were in Mavallipura, one of the fifteen villages administered by the Shivakote Gram Panchayat, situated in the district of Bangalore Rural. 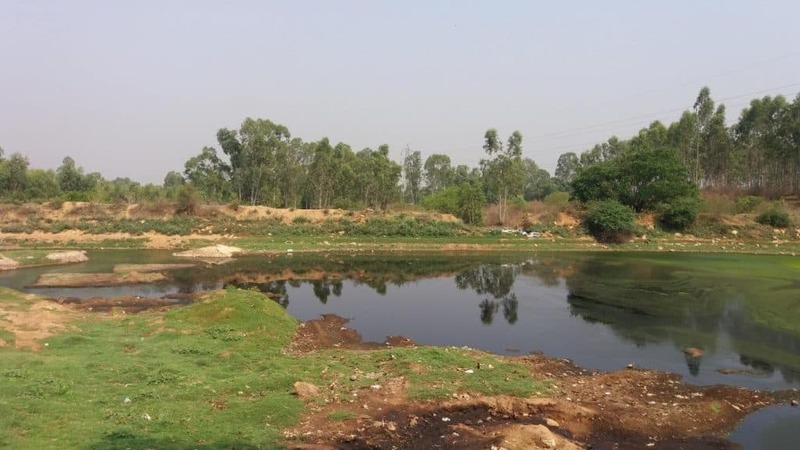 Once an ecologically bountiful region of which the serene environment still bears a testimony, Mavallipura was a landfill site till 2012, where around 200-300 truckloads of untreated waste (around 1200 tonnes) were being dumped daily. The region became a designated landfill spot since 2003, generating extensive toxic hazards and adverse ecological impacts on the adjoining villages and its livelihoods. The dumping was initiated after an agreement of land lease was signed between the Bruhat Bengaluru Mahanagara Palike (BBMP) and a local resident farmer named Bailappa, in blatant violation of Municipal Solid Waste (Management and Handling) Rules 2002 as well as other mandated regulatory standards. Bailappa owned agriculture land near the Jarakabande Kaval State forest, which he started encroaching for farming. BBMP entered into the lease contract and even paid him substantially (INR 1000) for each truckload of waste dumped in his land. Although Bailappa claimed that the said land was his own, a formal survey revealed that he appropriated at large, significant amount of forest land for commencing the landfilling. When intimated, the Karnataka Forest Department remained reasonably taciturn on initiating any action against him and instead, resorted to merely burning the piles of wastes dumped over the years. After the Karnataka State Pollution Control Board (KSPCB) initiated a criminal proceeding against Bailappa in 2006 and the illegal landfill was abandoned, BBMP signed a deal with the Ramky Infrastructure Ltd for establishing alternative ‘scientific landfills’, nevertheless on the grazing lands (go–mala) of Mavallipura village. However, Ramky performed little on the seemingly ‘scientific’ methods of waste processing. While talking to B Srinivas, one of the key functionaries of the Shivakote panchayat, we learned that although the landfill has been closed since 11th July, 2012, its debilitating impacts are deeply ensconced on the local ecology and livelihood of the villagers. He also explained how the villagers have resisted the ceaseless attempts made by BBMP to reopen the landfill forcefully post 2012. Ramky’s ‘scientific landfill’ came up in one of the most productive landscapes of Karnataka, where local village communities practiced dairy, agriculture and mixed varieties of farming. Srinivas mentioned that the milk that was produced from this area was regarded as the best by the Karnataka Milk Federation (KMF), the apex body for the dairy co-operative movement in Karnataka and the second largest dairy cooperative in the country. After Ramky’s landfill was initiated, KMF banned milk supply from the region on the grounds that the milk now delivered bears significant quantity of contamination. The community, which was largely dependent on dairy, now sells off their land and cattle to bear the medical expenses incurred from the bad toxic air of the village. According to Srinivas, villagers who were mostly dependent on farming have now shifted to corn production, because of its high resistance capacity to toxic water. Villagers who have been cultivating sugar cane complain of the low water availability because of the depleting ground water level. According to Srinivas as well as other villagers, the three Reverse Osmosis (RO) plants that have been set up by BBMP in the village for providing better quality drinking water are not operational, since BBMP owes an amount of nearly INR 80,00,000 to the RO contractors. The villagers presently depend upon the 14 bore-wells in the village, despite the water being highly contaminated by the effects of the toxicity. Health impacts of the waste dumping are even more severe in the village. Conversation with the local communities revealed that the waste management practices and the unbearable stench of the dumped waste has caused dengue, malaria, skin and throat infections as well as pre and post-pregnancy complications. Villagers have also contracted terminal illness like cancer and gastro-intestinal troubles. Assurances of setting up medical camps and governmental aids towards treatments are far from the practical realities. Additionally, Ramky’s landfill has posed difficulties for the three nearby airports, out of which two are Indian Air Force Bases. The Yelahanka Defence Air Force Base is the closest, at a distance of only five kilometres from the site, while the Jakkur Defence Airbase and the Kempegowda International Airport, Bengaluru are situated at a distance of merely 7 km and 19 km respectively. There have been instances of collision with bird in the past, since scavenging birds frequent the landfill area. The landfill grossly violates the Aircraft Rules, 1934 in this respect, which mentions that no landfill can be located within a distance of 20 km of any airport. Any landfill within such radius mandatorily requires a No Objection Certificate (NOC) from the airport authorities to ensure that the aforementioned accidents are avoided. Over the years mountains of untreated waste got piled up, and that’s all one can see surrounding the village area. Waste treatment remains far from reality, as treatment plants work below the capacity and only 20% of the waste gets converted into compost. The grazing land, where the present landfill is located, is an ‘empty space’ for the state, with no consideration of the cultural relationship it shares with the people. Can court battles help Mavallipura? 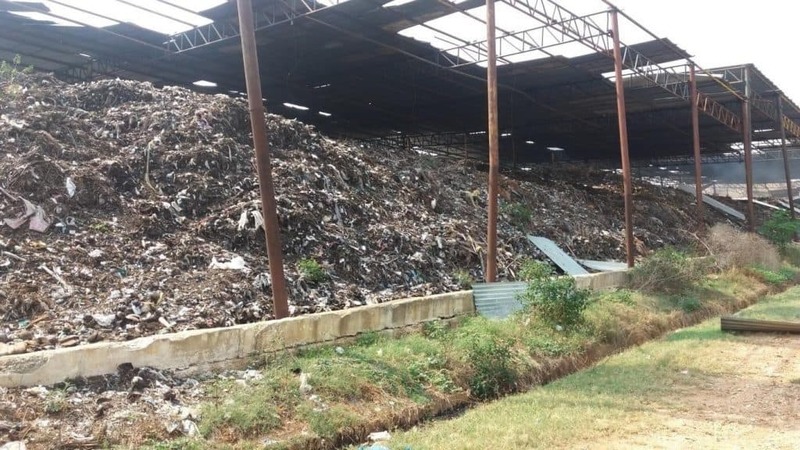 Several Public Interest Litigations (PILs) were filed drawing the attention of the High Court of Karnataka to the collapse of the solid waste management systems of Bengaluru. These PILs, mostly initiated by the NGO named Environment Support Group (ESG) since July 2012, and thereafter, continue to be heard by the Court. The outcome has been an extraordinary effort on the part of several Judges of the High Court of Karnataka who invested substantial amounts of time in appreciating the nuances of the problem and moulding relief and directions in a manner that can be considered amongst the most progressive efforts in environmental jurisprudence in recent years. However, the systems that operate in Mavallipura have not been co-operative. The landfill at Mavallipura is yet another example of widespread dilution of environmental standards by the state. It illustrates the attempt by the bureaucratic functionaries to usurp community-managed commons located in the peri-urban areas. There are widespread socio-ecological as well as health impacts in converting productive common village lands into landfill sites, causing catastrophic conditions, endangering lives and livelihoods. Along with efficient waste management, the present vulnerable ecology of Mavallipura also suggests urgent consideration of the local livelihoods and human health, both of which are adversely affected by the landfill. Note: Leo Saldanha and Swetha Rao Dhananka from Environment Support Group (ESG), Bengaluru and Dechamma C.S. from Mahadevpura Parisara Samrakshane Mattu Abhivrudhi Samiti (MAPSAS) contributed to this article, with help from Mallesh K R and Namrata Kabra from ESG.